After ordering huge Yinglings and looking down the burger menu, I saw too many burgers I wanted to try. There was the All American Classic cheeseburger with American cheese, onion, lettuce, tomato, pickle and Thousand Island dressing – how could one go wrong? But then there was the Steakhouse Blue Burger with lettuce, onion, tomato, Wisconsin blue cheese, horseradish sauce and A1 – a great combination that just couldn't be bad. And then there was the Hickory Burger with lettuce, tomato, onion, cheddar, bacon, an onion ring and BBQ sauce – decadent and utterly tempting, at least for the first bite or two. And finally, there was the Caliente Burger with lettuce, tomato and caramelized onion, pepper jack cheese and roasted Serrano and cilantro pesto – very creative and mouthwatering. How could one decide? I was afraid I'd regret my decision. Finally, I was all set to order the Caliente Burger – the same one Julia had decided on in its veggie patty version – when I saw at the very bottom, the ultimate. 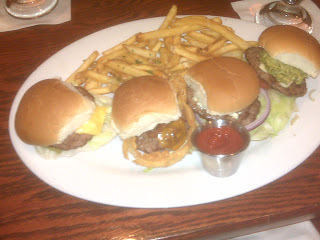 Mini versions of all four burgers which were tempting me, all on a single plate! What luck – no regrets needed! And what an amazing dish it was. Each one slightly more different than the last, I had the perfect amount of each. It was a foodie's dream. American: Classic and delicious, highlighted by the pickles, onions and American cheese providing enough salt and tang to groove up the classic patty and bun. You all know the taste – can't go wrong. Steakhouse Blue: If there could have been a weak link, it was this burger. Its taste was quite interesting but didn't have a lot of bleu or horseradish flavor and was slightly sweet. A little more flavor from the star ingredients and this would have gone from pretty good to great. Maybe it’s because I am not much of an A1 sauce person, but I don't see how horseradish and blue cheese could have been overshadowed by the sweetness of anything else. Hickory: The onion ring, the bacon, the cheese, the BBQ sauce. All played together as well as you would hope they would. Crunchy, savory, sweet, tangy and salty all together. My one complaint is the onion ring being a little to crusty – I would have preferred a lighter, crispier ring, perhaps a tempura-style ring. Nevertheless, it was tasty even after two bites, which was better than expectations. And since I only had three bites of the burger on there anyway, I never had to eat too much to get disappointed with it. Caliente: The flavor on this burger was incredible. Julia and I both noticed it was very hard to eat. I informed her that that is how you know it's a good burger, but in all honesty, it was a little “slippery.” That was probably due to the awesomely flavored, yet thick and generous Serrano and cilantro pesto on each burger. I couldn’t believe how much of this thick, green stuff we were given, but it was remarkable. I have never had a burger with so much umph before and this one had a layered, lasting flavor, but not overpowering or too spicy or anything. A real winner in my book. If I had to go back and get just one burger? Maybe the American. Or the Caliente. Or maybe I'd see if they could do a full sized burger with one third American, one third Caliente, one sixth Hickory and one sixth Steakhouse Blue. You know, if I could vote proportionally.